It takes me a long time to forgive, longer to let go. It’s harder when the object of my forgiveness doesn’t apologize, and harder still when the object disappears, leaving me to do the work of relationship on my own. Look at me, I want to say. Put your hand here where it hurts. I don’t want to punish; I just want to be seen. I was spending Valentine’s Day at the dollar movie with my girlfriends because that sweet boy who’d put a journal in my hands all those years ago got engaged to someone else. Though we’d broken up when I was nineteen, he’d written to me during those two years after college when I was a Jesuit Volunteer in Belize City. His letter kicked off a sweet and hopeful correspondence between us. We made plans for him to visit, talked of our hearts coming full circle. And then there was silence. No letters, no calls, except that one from my mom telling me he’d met someone else. Though we had promised each other nothing, in my mind, the story ended with us together. I learned a lot in Belize, how to bake bread, how to play guitar (well, sort of), how to pray, how to coordinate a youth group and a parish fair, how to teach twelve-year-old girls to play volleyball, how to write every day, no matter what, how to enter and re-enter a long and deep healing process that I didn’t even know I needed. Belize cast light on my shadows, and some of them followed me home. Those days and nights after the St. Valentine’s accident were filled with fear, a sense of dread and doom. On our first trip to the credit union, before my mom and I spoke with the “cease to exist” guy, we’d met with an in-house financial advisor who’d said we weren’t eligible for credit union membership. No membership equaled no loan, which equaled no car to replace the one totaled on the night for lovers. As we drove back to the dealer to explain our plight, clouds settled over me, darkening the crisp blue of Albuquerque’s winter sky. My mom might have said, “It’s okay. We’ll figure it out,” or perhaps commiserated with a “yes, that woman was rude.” But I had already left her for the land of Nothing Ever Works Out For Me. We find a great car in my price range, but I can’t get it. And I wouldn’t need a car if my old one (read: my parents’ car) hadn’t been totaled. And that car would be fine if I just had a boyfriend to take me out on Valentine’s Day. There have been blessedly few periods in my life when I have felt like Charlie Brown, the Wicked Witch of the West, and my overgrown five-year-old self all rolled into one, alone, threatened, afraid, certain the moment I step outside, a house will land on me. But when those periods hit, they feel eternal. These periods have all been preceded by a Major Life Event (emphasis mine)—a breakup, an accident, a move, a loss, sometimes all at once. Just as in the midst of a migraine, you can’t remember a time when your head didn’t feel like it was being stabbed from within by an icepick, when depression hits, you can’t remember your joy. And if there ever was joy, it was fleeting, the bright spot in an otherwise overcast life. In a depression, I might call a friend, go for a run, or take a nap. Sometimes I’d bake just to have a sense of accomplishment. 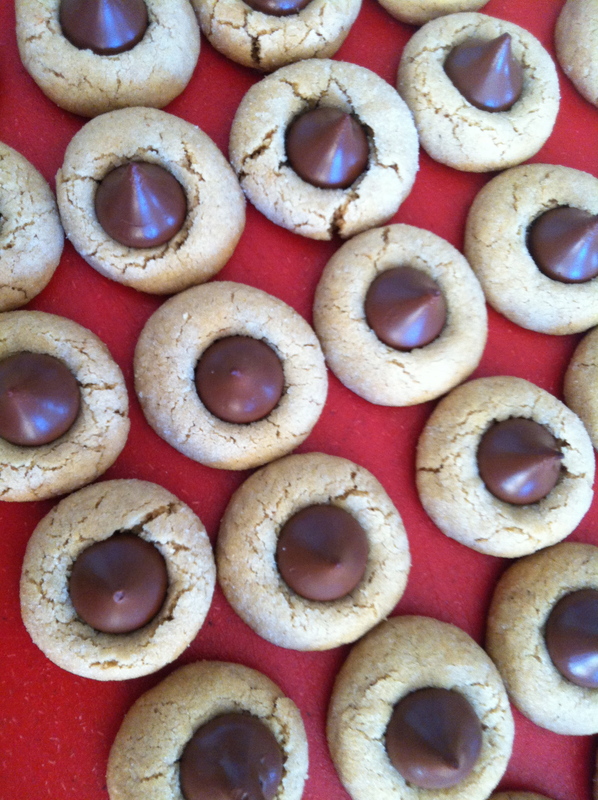 Look at me, I made four dozen Hershey Kiss cookies. Maybe I am capable. Maybe I’m not a loser. Maybe I won’t have to live in my parents’ garage. Whatever the lifeline, its lift was temporary. Soon enough, I’d have to hang up the phone, jog home, wake up, or find something to do with all those damn cookies (besides eating them, which just leads to an even deeper depression). Sometimes I would turn to my journal with a pen to bleed out some of the sickness. I tried never to read over what I’d written in the past for fear I’d find the same ailment that plagued me in the present, or worse, that those entries from Joy would feel like dispatches from a far-away land that I would never visit again. Relating to depression in this way feels a lot like cursing the wind. I don’t have to like the grit in my contact lenses or the toppled trash bin; but questioning the wind’s presence doesn’t relieve my eyes or improve the condition of my yard. Telling the wind to f@#* off doesn’t impact its force or change its direction. It only inhibits my movement. So next time—if there is one—depression enters my room, instead of pretending I don’t see it or telling it to go, I might step closer to it, observe it, relate. Look at me, it will say. Put your hand here where it hurts. It doesn’t want to punish. It just wants to be seen. Weeks earlier I had been rear-ended by a Dodge Ram Charger in a 4-car pileup and totaled my parents’ Ford Taurus. The accident happened on Valentine’s Day, and my dates were my roommate Beth and a woman I’d met in group therapy. We were on our way to the dollar theatre to see The Empire Strikes Back when the Toyota Camry in front of me slammed on the brakes. I screamed, certain that I was about to plow my parents’ car into the rear bumper, and then breathed a sigh of relief when I realized we had stopped short. In an instant, a bad thing had become a good thing, and I had made that happen. Beth, in profile, her face illuminated by the Kentucky Fried Chicken sign across the street, opened her mouth to speak. She might have turned to me, the light glinting off her glasses. The worst hits come out of nowhere. You go to the movies on a Friday night. You slam on the brakes. You exhale. Your friend opens her mouth to speak. But you don’t hear her. Instead light in the rearview catches your eye. The light makes you scream. Or maybe you were already screaming, and that’s why your friend opens her mouth to speak, to ask why. There is the before: holding tight to the steering wheel, as though it could protect you, bracing for impact, headlight filling the rearview, not looking back, knowing there’s nothing you can do. And there is the after: A man’s face in my window. “Oh my God, are you okay?” Stepping out of my car, the door still opens and closes. Radiator fluid pools on the road. Saying, “No, it’s okay, I don’t need an ambulance,” even though I probably do, even though I know that saying no is a misstep. An ambulance is a big deal. An ambulance is expensive. But there’s no blood, no broken bones. It could have crushed me. I could be dead. But I’m not crushed or dead. So I must be okay. I don’t remember the middle: the impact, the sounds, the smells, the feeling in my body. The body-mind is wise in this way; it protects us from pain until we are strong enough to feel it. 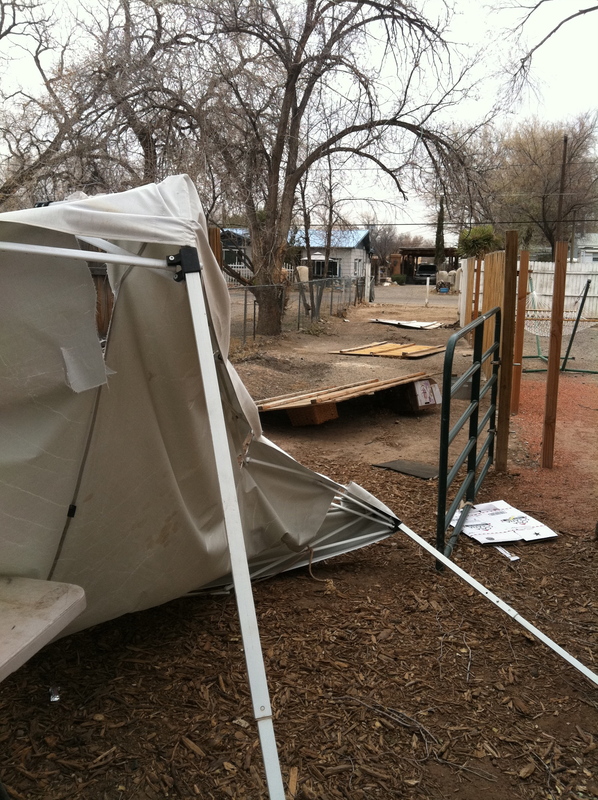 Little evidence remains of the late November windstorm that ripped off four panels of our fence and destroyed a tent in our side yard. Friends remounted three of the four panels. (The fourth is beyond repair and needs to be replaced.) 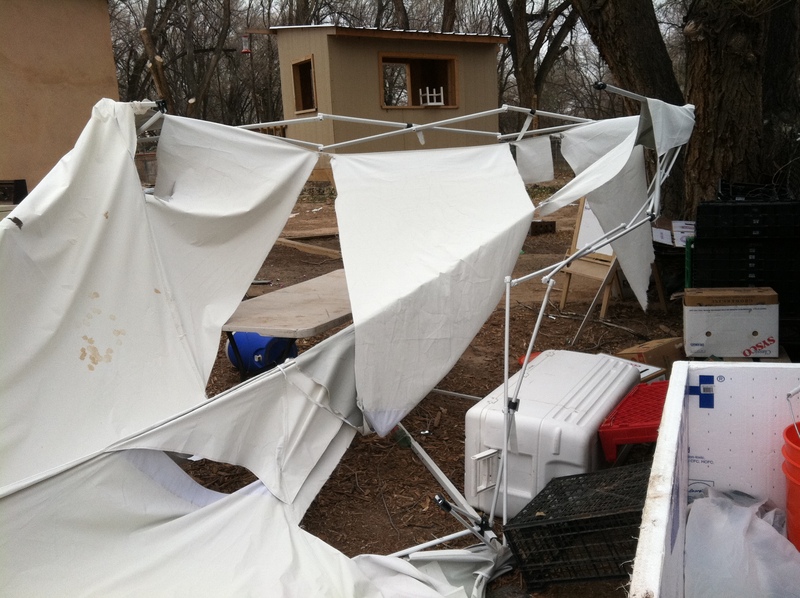 The Valle Encantado farm crew threw out the shredded tent and restacked the vegetable boxes and flats that the wind had scattered about the yard. Christmas afternoon, while Henry and the kids ran a quick errand, I walked the half acre on which our house sits, something I enjoy doing because it’s good to feel our dirt under my feet, to hear the neighbor’s geese honk, to open the back gate and step along the ditch. By the playhouse, I found two plastic storage bin lids we were keeping on the porch by the office side door until we could find their corresponding containers. The wind had blasted a hole in the bin that once held them. Princesa and Oso, the German Shepherd and Golden Retriever next door, cried as I approached the fence separating our two lots. They were probably outside in their little pen when the windstorm hit. They are south valley dogs. Like the dogs I knew in Deming when I was a kid, they don’t get much more than food or water. If they go in the house at all, they don’t sleep on dog beds at their owner’s feet. I try to pet them when I walk the arugula and cucumber beds in that corner of the yard. But Christmas afternoon, their cries unnerved me. I wanted to stick my hand through the chain link fence and pet their noses like K. and P. do, but I worried they would bite me. Oso tried to pull herself up on top of the doghouse. Princesa leapt along the fence. They were desperate. They needed too much. 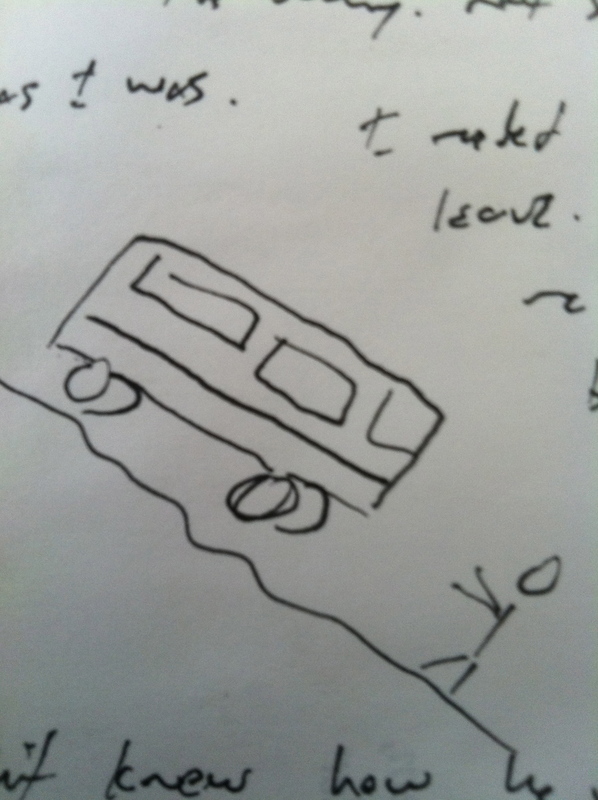 I wrote in Flake, Part II about the people in my life who make me feel small. What hurts in those instances is not my shrinking, not exactly. It’s the feeling I would have if I were stuck out in that windstorm with Oso and Princesa, knowing that I can howl and bark and whimper all I want; and the wind won’t stop. Or maybe it will. It’s knowing that the wind is indifferent toward me, that nothing I do or say alters its course or its ferocity. Those people who make me feel small are like that windstorm. I can shake my fist as they shred a tent or rip my fence off its hinges; but my fist shaking does not change them. And their raging is not about me. The trauma in my life has been about ambush, the attack that comes when I least expect it. The Dodge Ram Charger that slammed into my Taurus. The angry phone call that Sunday evening. The cough that was cancer in my grandmother’s lungs, that killed her from fall to winter. The sixth grade girl I worshipped, who told me as I drank water from the stone fountain on the Chaparral school playground, the secret that was rupturing my family. The older boy, or maybe he was a man, in my friend’s bedroom, who said he would show me a neat trick if I promised not to tell anyone. Sometimes I am Oso and Princesa. Sometimes I am the person on the other side of the fence, the person who can choose to engage or not. The person who doesn’t need the dogs nearly as much as the dogs need her. The one who even fears the dogs a little because I recognize something of them in me.